We’ve been staying busy staging homes. But we’ve also been very busy de-staging a lot of home after quick sales! Here’s another example of a happy customer. This property was a gorgeous ocean front property that was sitting on the market for approximately 6 months. The owners had been relocated to the US for work and were not able to successfully sell their home before their relocation date. After they moved it then sat vacant on the market. Vacant homes can be even harder to sell. The US relocation firm for the company worked with the real estate agents to have the property staged as they needed to have it sold asap. It was listed just under $1 million dollars. That’s a hefty mortgage to be sitting on! The living room was exceptionally large and overlooked the ocean. The room also had a double-sided. We created two seating areas in the living room, one focused around the gorgeous fireplace. We brought in a leather chaise closer to the window to create a lounging or reading area overlooking the ocean view. Imagine your self sipping coffee or reading a book from this spot. The photos that were on realtor.ca before staging showed the home filled with very eclectic furniture and artwork. It was a bit over the top. That’s fine for living in your home, however, when you’re selling you need to appeal to the masses. With a beautiful view like this a subtle, calm but sophisticated room is what will sell. We used modern contemporary furniture and décor to compliment the home and show case it at its full potential. 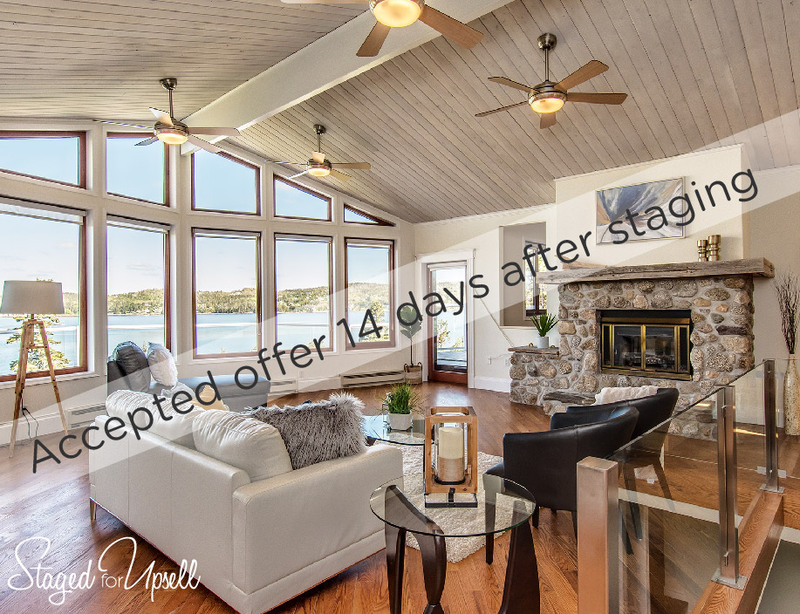 We were excited to hear that they had an accepted offer 14 days after staging the property. We’re asked all the time if house staging really works. The answer “Yes, good home staging works!” Give us a call today!